Staff within an organizations come and go, and as an admin you may have to reset user's password for a number of reasons. Resetting a password within Salesforce will trigger an email to user's inbox, and the user will click on the link to reset their password. More often than not, an admin may need to reset user's password without triggering an email or user's acknowledgement. This is how you do it. a. Login to Salesforce as an administrator. b. Click your name -> Developer Console to launch a console window where you can run SOQL and Apex Codes. c. Click Debug -> Open Execute Anonymous Window. d. On the developer console window (Enter Apex Code), type the following command. 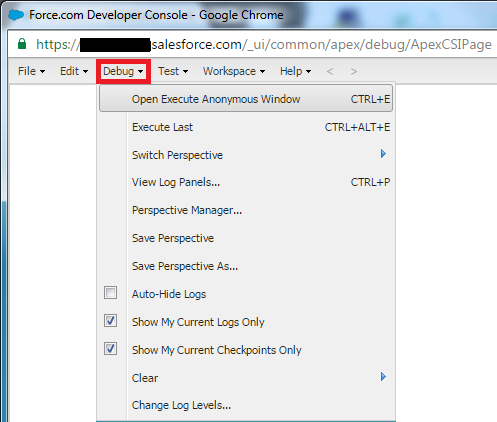 Upon successful execution of the above Apex command, the user's Salesforce password will be changed to 'New Password'.